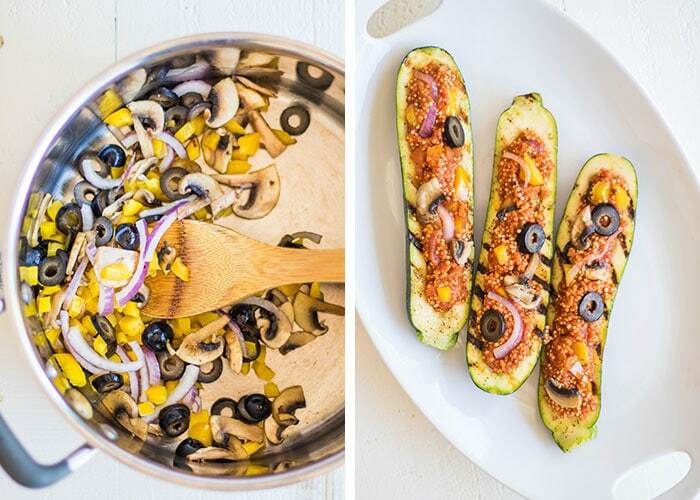 Mix up your Summer grilling routine with these meatless Grilled Quinoa Pizza Zucchini Boats. These are a veggie supreme combo, stuffed with sautéed mushrooms. peppers. onions and olives, but mix it up with your favorite pizza toppings! If your kids love pepperoni, adding a few slices on top might just entice them to eat grilled zucchini for dinner. Disclaimer: This post is not sponsored, but I received a gift of Uncle Steve’s organic pasta sauces, and since I loved them, decided to use them in this recipe. All opinions are my own. 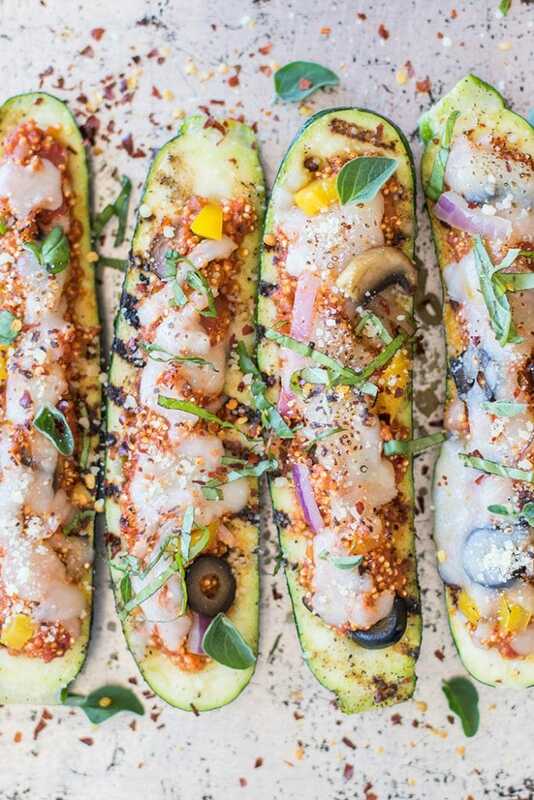 I wanted to come up with some interesting vegetarian BBQ main dishes this summer– and these Grilled Quinoa Pizza Zucchini Boats are a winner! We love grilled zucchini. Most of the time, I just drizzle it with olive oil and season with salt and pepper. It’s good just simply prepared. I also sometimes coat it with parmesan cheese, thyme and paprika. It’s really awesome that way — like cheesy zucchini fries. When I received a box of Uncle Steve’s organic pasta sauces in the mail, I knew I needed to do some type of grillable pizza. But I wanted to keep it easy, and gluten free pizza crust? Not easy. To make it even easier. I experimented with making the quinoa pizza filling in 1 pan. I started by sautéing the veggies, and then adding a jar of tomato basil sauce, and some quinoa. It simmered on the stove and gave me enough time to fire up the grill and hollow out the zucchini. I never realized how difficult it is to get large zucchini early in the summer! The small ones are everywhere. These would be awesome with late-summer big zucchini, especially the ones that have started to hollow in the center. I used a spoon and hollowed out the centers, leaving a bit of an edge to grill. I drizzled these with olive oil, seasoned lightly with salt and pepper, and grilled the cut sides. After I stuffed with with the quinoa pizza mixture, and sprinkled some cheese on top, they took about 5 more minutes on the grill to heat up the mixture enough to melt the cheese. Make it Vegan: Sub the mozzerella for a non-dairy vegan cheese, or just omit and add extra herbs to the top! Make it Paleo/Whole30: These would be awesome with cauliflower rice instead of quinoa! I imagine the filling would cook pretty quickly with cauliflower rice instead of quinoa, but I have never tried it. Omit the cheese as well. For the Family: My niece and nephew DON’T like zucchini- they have told me many times. We added some organic nitrate free pepperoni to the tops of these, and suddenly zucchini didn’t look so bad! Add whatever pizza toppings your family enjoys! A fun vegetarian main dish for a summer BBQ! 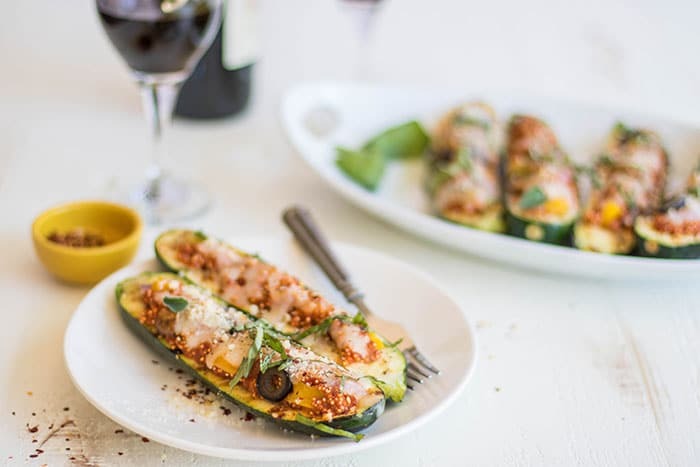 These delicious zucchini boats are stuffed with veggies and quinoa and are a healthy way to enjoy all the flavors of your favorite pizza. Heat up a BBQ to medium high heat. In a skillet with a lid, add 1 tablespoon olive oil, and heat over medium high heat. Add all the pizza veggies, and saute for about 5 minutes. Add the tomato basil sauce and quinoa, and stir until mixture starts to bubble. Lower the temperature to low, and cover the skillet. Continue to simmer covered for 15-20 minutes, until quinoa has cooked. Prepare the zucchinis by cutting them lengthwise. Use a spoon to scrape out the seeds making a long hollow down the centers of the zucchinis. Brush both sides of the zucchini with olive oil, and season with salt and pepper. Add zucchini to grills cut side down, and grill for about 5 minutes. Remove zucchinis from grill, and stuff the hollows with the quinoa pizza mixture. Top with shredded mozzarella. Add zucchinis back to grill and cook for another 5 minutes or until cheese melts. Garnish with parmesan cheese and fresh herbs and serve hot. I used Uncle Steve’s Tomato Basil sauce in this recipe, and loved it. I love that his sauces are made from organic tomatoes imported from Italy, and contain NO SUGAR (a huge plus in my book!). The sauces are available on Amazon and through the company’s website, and are currently going into stores all across the US. These are so super creative! 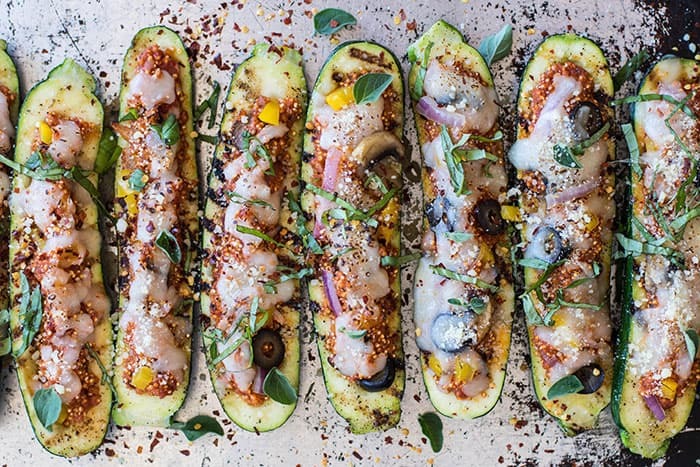 Cannot wait to try these gorgeous stuffed zucchini! Thanks Jenn! They are delicious. pizza flavored EVERYTHING is my jam, and we are all about the grill right now - cannot wait to taste these! Pizza toppings are so fun to add to recipes! I have been cooking like 90% of our meals on the grill the past month! This looks AMAZING! I love zucchini and this is so perfect for summer. What an awesome idea! These look so delicious! Soon, I will have a plethora of zucchini! Thanks for the inspiration! This recipe is perfect for when your garden is overflowing-- especially for those giant ones! You have to hollow those out anyway! Yum! A perfect use of overflow zucchini in the summer - and great for Meatless Monday! Such a lovely twist on Pizza. I have a few zucchini in my fridge waiting for attention. Time to make some Pizza. Yum. Thanks for the inspiration. What an amazing idea! Love it. I could so make this for a party. Great shots as well. Zucchini is one under rated vegetable and good to see it being put to great use here. I love zucchini! Use it all the time. I've been eating it raw in salads a lot lately! Oh hi there, low carb perfection!! Seriously, this looks too good. Love all the different toppings you could add, too!